Duke University Press, 9780822352143, 344pp. 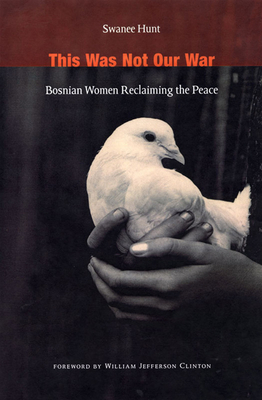 This Was Not Our War shares amazing first-person accounts of twenty-six Bosnian women who are reconstructing their society following years of devastating warfare. A university student working to resettle refugees, a paramedic who founded a veterans' aid group, a fashion designer running two nonprofit organizations, a government minister and professor who survived Auschwitz--these women are advocates, politicians, farmers, journalists, students, doctors, businesswomen, engineers, wives, and mothers. They are from all parts of Bosnia and represent the full range of ethnic traditions and mixed heritages. Their ages spread across sixty years, and their wealth ranges from expensive jewels to a few chickens. For all their differences, they have this much in common: all survived the war with enough emotional strength to work toward rebuilding their country. Swanee Hunt met these women through her diplomatic and humanitarian work in the 1990s. Over the course of seven years, she conducted multiple interviews with each one. In presenting those interviews here, Hunt provides a narrative framework that connects the women's stories, allowing them to speak to one another. The women describe what it was like living in a vibrant multicultural community that suddenly imploded in an onslaught of violence. They relate the chaos; the atrocities, including the rapes of many neighbors and friends; the hurried decisions whether to stay or flee; the extraordinary efforts to care for children and elderly parents and to find food and clean drinking water. Reflecting on the causes of the war, they vehemently reject the idea that age-old ethnic hatreds made the war inevitable. The women share their reactions to the Dayton Accords, the end of hostilities, and international relief efforts. While they are candid about the difficulties they face, they are committed to rebuilding Bosnia based on ideals of truth, justice, and a common humanity encompassing those of all faiths and ethnicities. Their wisdom is instructive, their courage and fortitude inspirational. Swanee Hunt chairs the Washington-based Institute for Inclusive Security. During her tenure as U.S. ambassador to Austria (1993-97), she hosted negotiations and symposia focused on securing the peace in the neighboring Balkan states. She is a member of the U.S. Council on Foreign Relations, the Eleanor Roosevelt Lecturer in Public Policy at Harvard University's John F. Kennedy School of Government, the president of Hunt Alternatives Fund, and the author of Worlds Apart: Bosnian Lessons for Global Security and Half-Life of a Zealot, both also published by Duke University Press.